"When a dragon grows this old it knows nothing but pain. Constant pain. It grows decrepit, crippled, pitiful... spiteful." In a scene revisited countless times in fantasy tales, our young hero Galen (Peter MacNichol) braves the evil dragon's cave to save the beautiful princess Elspeth. His hands carry a massive lance magically enhanced to damage the grand beast. Upon entering its domain, however, Galen witnesses a stunning visage that seems out of place in this fantasy. The dragon's young spawn are chewing on a girl's body and forcibly amputate her bloody legs. After a quick moment of shock, the hero continues on his quest, but that grisly image remains in our head throughout the hokey finale. Dragonslayer provides a sloppy and surprisingly dull tale that only rarely moves beyond its generic conventions. One of these scenes is stunning given the film's PG rating, but it matches this story's generally dour mood. I have to admit my admiration for science fiction and fantasy stories, especially when they're treated with the respect they deserve. One major reason for the abundant success of the Lord of the Rings trilogy is their treatment as "A" movies that tell an important story. Peter Jackson focuses as much on the dramatic elements as the creature effects, which helps to generate compelling cinema. Memorable pictures like Clash of the Titans, Ladyhawke, and Excalibur make the story essential along with the fantasy aspects. Their creators understood that while a creature may be interesting, it is not the only necessary part of the tale. This film tackles a very straightforward story involving few characters and little emotional weight. Following the death of his master, apprentice Galen visits a land terrorized by the old dragon Verimithrax Perjorative. The land's king Casiodorus Rex (Peter Eyre) has made a pact whereby one virgin girl is sacrificed to the dragon each month to save the land. They conduct a lottery with the eligible girls whose fathers lack the money to buy their way out. It seems like these dads would be hurrying to find men for their daughters, but I digress. Galen arrives and surprisingly performs several deeds of magic, which appear to stop the dragon but actually anger it even more. When the giant creature wreaks its vengeance on the land, Galen decides to face the apparently unstoppable foe in its fiery lair. How does the dragon look, you ask? Considering that the film is 22 years old, it looks extremely impressive. Industrial Light and Magic's Go Motion technique generated a surprisingly believable dragon that glides through the air fluidly. Some clunker moments do exist, especially during an early scene with a young girl and some odd sets. However, the dragon is easily the movie's high point and works pretty well as a serious menace. Writer/director Matthew Robbins keeps the full being off the screen until the final act, which builds the tension but also leads to boredom. A threat provided by the human Tyrian (John Hallam) never really makes sense and proves to only be a time waster. The computerized dragon is a majestic presence, but it also falls a bit short because the tale drags too much in its first half. A good fantasy almost always needs a love story, and Dragonslayer includes one with Galen and Valerian (Caitlan Clarke), who initially appears dressed as a man. Once she changes into a dress and they exchange some furtive glances, love happens with hardly an explanation. Clarke does okay with little depth, but MacNichol's bright-eyed stares get old very quickly. There's little feeling in this romance and it reads more like a genre requirement than a human connection. Pulled away from the dragon fights, their scenes are the quality of bad television soap operas. Peter Eyre also struggles with crafting an unlikable and pitiable character as the king, who comes off poorly. His final act makes little sense, especially when the onlookers cheer for something never viewed. This moment gives a perfect summary of this film, which struggles to find a interesting tone apart from its climatic dragon scenes. Image Transfer Review: Dragonslayer utilizes a remastered 2.35:1 anamorphic widescreen transfer that often presents attractive outdoor images. These shots are bright and spacious, and showcase the importance of the widescreen format to this picture. Unfortunately, this transfer also contains far too much grain at times to make it a top-notch release. Certain darker moments provide hazy images that probably exist due to print issues, but they still cause a problem. On an overall level, the images work acceptably, but the presentation falls below the level needed for a strong recommendation. Audio Transfer Review: This release offers a solid 5.1-channel Dolby Digital transfer that presents the almost constant music clearly. The dragon sound effects work well and creates a generally powerful environment. However, this track's complexity is rather limited, and it lacks the sharpness of the best DVD transfers. The rear speakers are used sometimes, but they never become a major player in the big scenes. This disc also contains a 2.0-channel Dolby Surround track, which provides an adequate but centralized experience. Extras Review: This disc's lone extra features are a paltry 12 chapter cues and English subtitles. 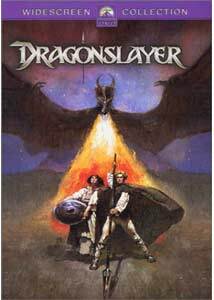 Dragonslayer has been given cult status over the years and is considered by a surprising number of fantasy fans as one of the great films in the genre. However, if you look past the impressive dragon, the story contains few moments of value. The lead characters fail to generate excitement, and the twists are mostly obvious long before they occur. This film is worth seeing for the attractive special effects, but it falls short when compared to many fantasy classics.